Who Would Buy This: People who want their copying and printing to be more convenient will find the HP Envy 4520 Wireless Color Photo Printer with Scanner and Copier their perfect choice. Considering its design and features, it is clear that the Envy 4520 is intended to be versatile from the start, where you can print borderless, lab-quality photos and laser-sharp documents with ease. Plus, it allows you to print wirelessly from your internet-connected PC, tablet or smartphone, and scan directly to your mobile device, while saving resources with its automatic 2-sided printing and optional high-capacity cartridges. With its built-in wireless capability, you can also share your photos with other PCs or notebooks or PCs on an existing wireless network, or easily print from your handheld devices at home, at work or on the go. 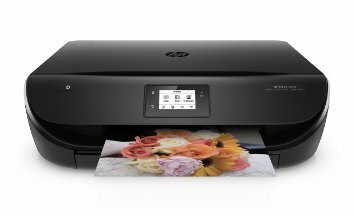 Setting up the HP Envy 4520 Wireless Color Photo Printer with Scanner and Copier is easy, where you do not even need to open its picture book or instruction guide. Aside from hooking it to the usual USB cable option to a computer, which is a more reliable connection as with other older computers, you will also have the option to connect it directly with its own Wi-Fi or through a wireless network. With regard to the on-screen prompts of the Envy 4520, it is just easy to follow. The Disk that comes with it will give you the option to load everything from the disk or from the web. However, HP does walk you through a many screens to get you to sign up for certain things, so watch what box you are checking if you do not want data checking or emails. One thing you should do though is to give the printer its own email address. Another huge perk to this copier and printer from HP is its mobile printing option. By downloading a free app to your tablet or phone, you can print any photo or document to the Envy 4520 any of those devices. One drawback to the HP Envy 4520 that you would notice would be that you have to adjust print options from your computer, and not from the printer itself. Nevertheless, this would not affect how you work around this printer for efficient work. With the HP Envy 4520 Wireless Color Photo Printer with Scanner and Copier, you can enjoy easy wireless setup with its Auto Wireless Connect feature. Aside from this, you can print borderless documents and photos of up to 8.5” x 11” in size and get useful content printed when you want it, from your web-connected HP printer. Plus, coloring pages, puzzles, recipes, news, coupons and more are included in it, so this item should be worth the purchase!